If life exists on Mars, scientists may be able to detect it by measuring the amounts of hydrogen and methane in the Red Planet's atmosphere, a new study suggests. 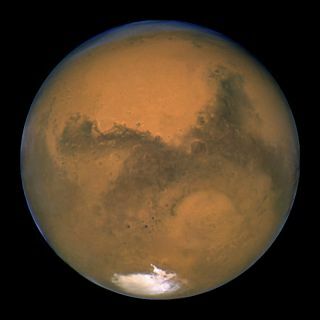 Finding lots of methane but relatively little hydrogen could be an indicator of active Martian life, according to the study. And scientists could make the needed measurements soon if they wanted to, researchers said. "What’s really nice about this is that it is an incredibly simple method," lead author Christopher Oze, of the University of Canterbury in New Zealand, said in a statement. "All you need to do is measure the methane and hydrogen levels on Mars, something that can easily be done now." The cold, dry and radiation-blasted Martian surface is generally viewed as inhospitable to life as we know it. But there could be oases of good habitat on the planet, in the form of hydrothermal systems, researchers say. Scientists think hydrothermal systems — which bring together water and energy — have existed on Mars at some points in the planet's history. NASA's Spirit and Opportunity rovers, for example, have found strong evidence of them in rocks that date back billions of years. Oze and his colleagues spent the last three years investigating the possible signatures organisms living in hydrothermal systems here on Earth might give off. Specifically, they zeroed in on the dynamics of hydrogen and methane production. Experiments in the lab revealed the levels of these substances that could be expected where life is absent. The team then looked at data from hydrothermal systems in the field that were packed with organisms. There was a clear difference, researchers said. "From our calculations, low hydrogen-methane [ratios] could indicate that there might be life, if it’s similar to that on Earth," Oze said. If life thrives in Martian hydrothermal systems, scientists should be able to pick it up — even if it's underground, the researchers said . "Lifeforms on Mars may be under the surface of the planet, where no probe can currently go right now," Oze said. "But methane and hydrogen formed in specific hydrothermal systems are eventually released at the surface, so all that needs to be done is for an analysis to be made at a vent to measure the gas that is released." Oze and his team published their results June 7 in the journal Proceedings of the National Academy of Sciences (PNAS).